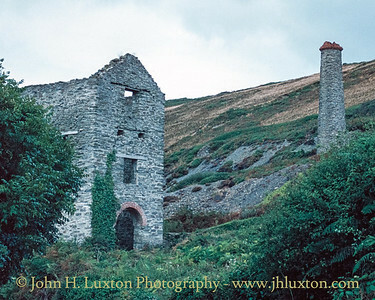 Blue Hills was mainly a tin mine worked four main lodes, namely: Baldhu Lode, Pink Lode, Straggler's Lode and Betsy Lode. 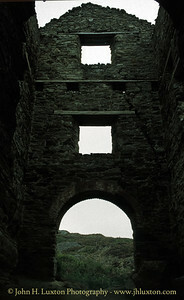 There were a number of shafts cutting the lodes, such as Blue Burrow Shaft on Baldhu Lode, whilst Pink Lode had Engine, Polyear's, Wheal Joy and Letcher's Shafts. 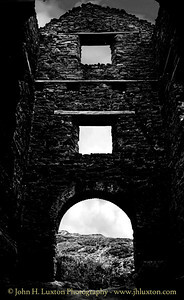 Wheal Betsy Lode was opened up by Wheal Betsy Engine Shaft. 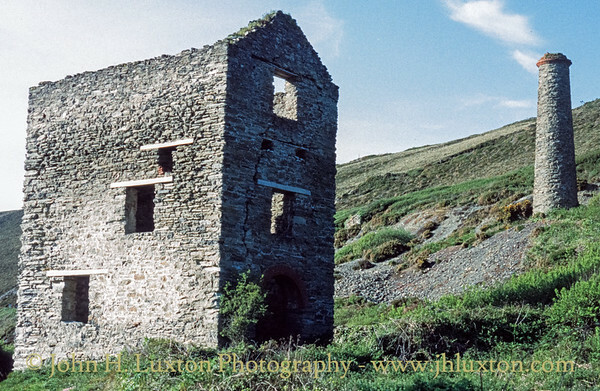 Blue Hills raised 2,117 tons of Black Tin between 1858 and 1897, with its best years being between 1886 and 1891. 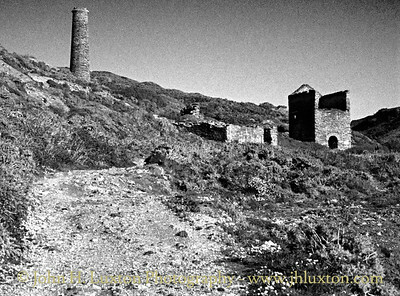 Wheal Betsy meanwhile, returned 45 tons of black tin between 1839 and 1861. Blue Hills was abandoned in 1897. 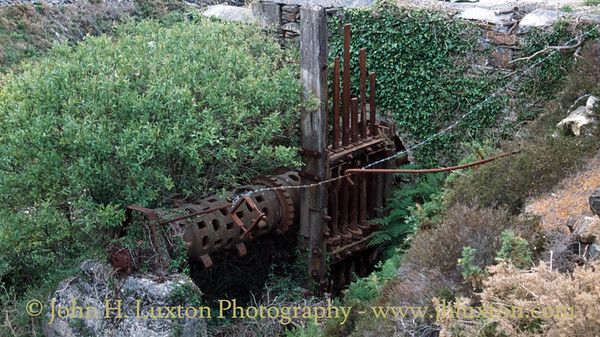 An attempt to rework the mine in 1926 came to nothing. 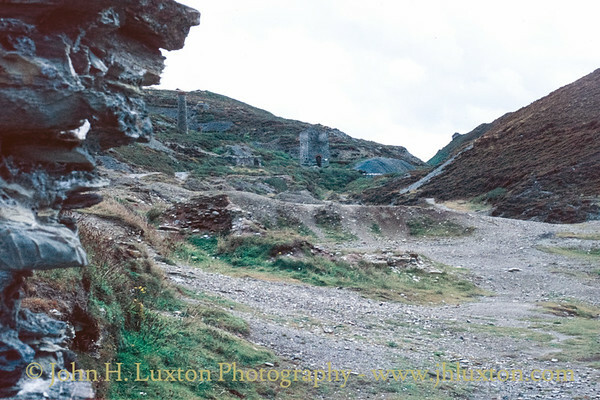 Blue Hills Mine featured in the first series of the original BBC TV Series Poldark in the 1970s. 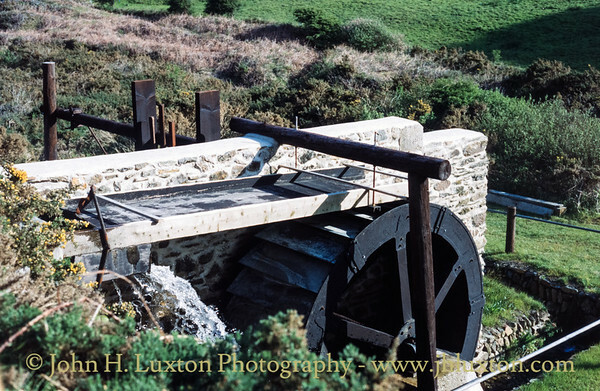 During the 1990s a set of water powered Cornish Stamps which existed on the site were restored and are now operated as part of the Blue Hills Tin Streams a visitor attraction and craft centre producing gifts made of local tin. 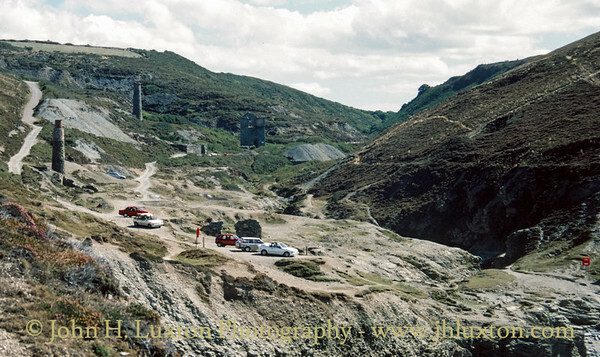 Blue Hill Mine site viewed looking up Trevellas Coombe from Trevellas Porth. 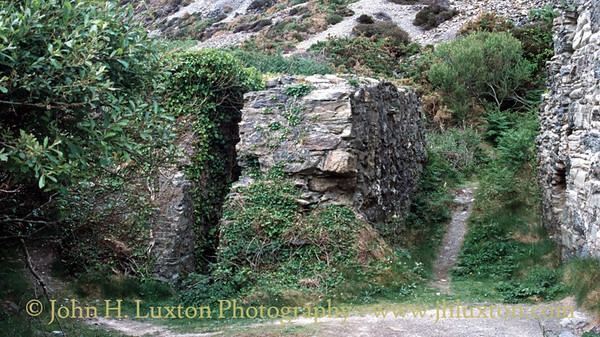 Blue Hills Mine engine house and stack in Trevellas Coombe. 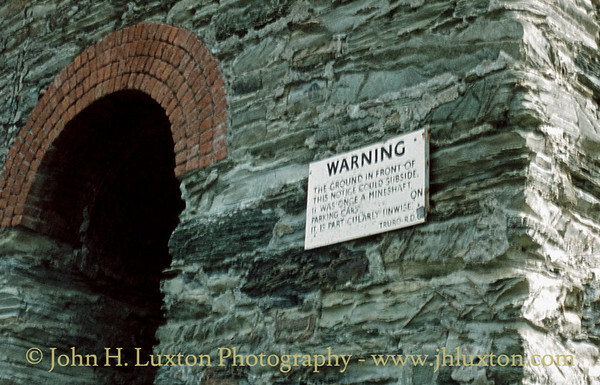 Good Advice from Truro Rural District Council (abolished 1974) was being offered to visitors to the Blue Hills Mine about where not to park cars affixed to the 'bob wall" of the engine house. 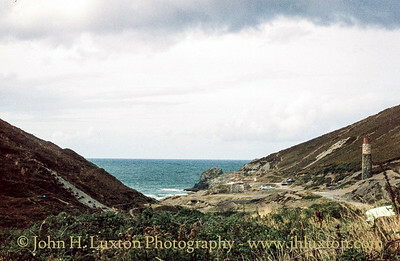 View down Trevellas Coombe to Trevellas Porth from the site of Blue Hills mine. 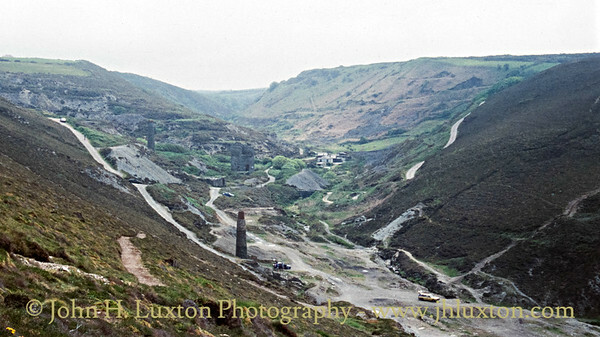 The area in the bottom of the valley in which the cars are parked was once the mine's processing works. 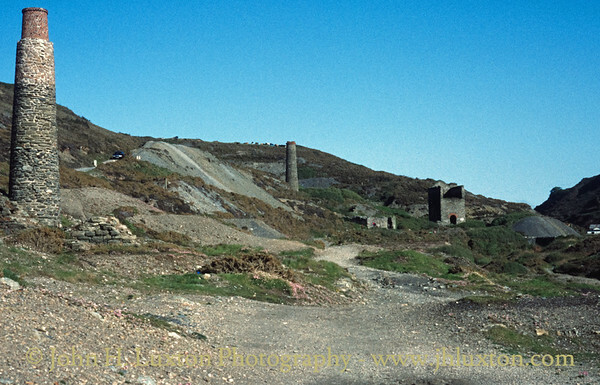 General view of Blue Hills Mine. 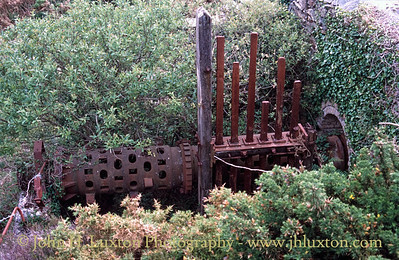 The loadings for the flywheel a horizontal steam engine at Blue Hills Mine. 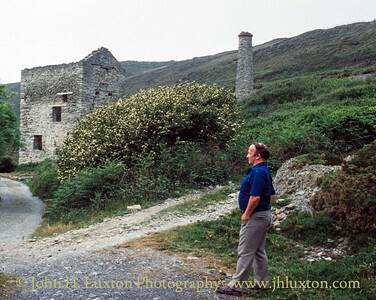 My father, John William Luxton, surveys the scene at Blue Hills Mine. 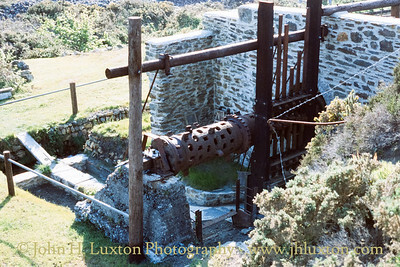 Engine House which housed a 70 - inch Cornish Engine. 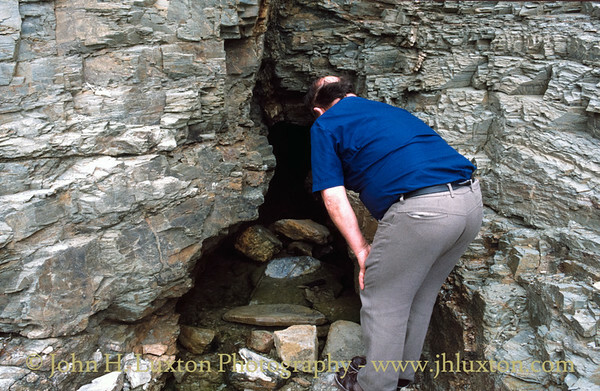 My father inspecting a mine adit opening onto the beach at Trevellas Port. 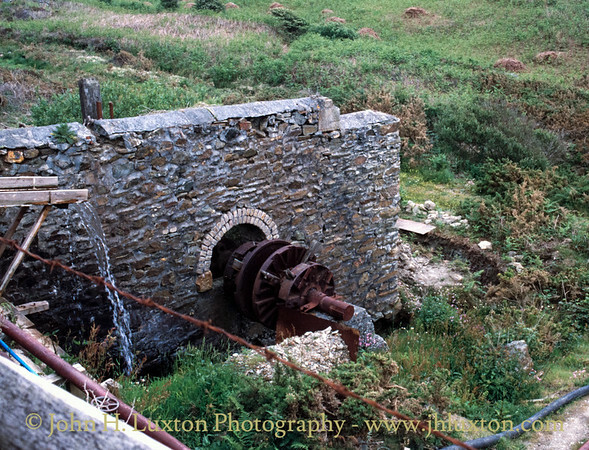 Blue Hills Cornish Stamps - initial restoration work is underway a view down the launder. The top of the stamps can be seen just to the left of the supporting wall. 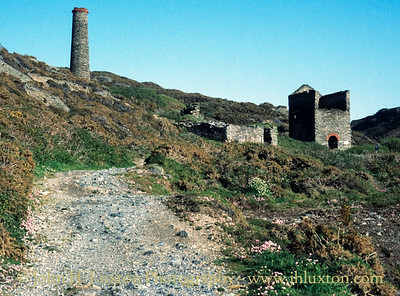 The Cornish Stamps at Blue Hills which had last operated in the 1930s, seen before the undergrowth had been cleared. 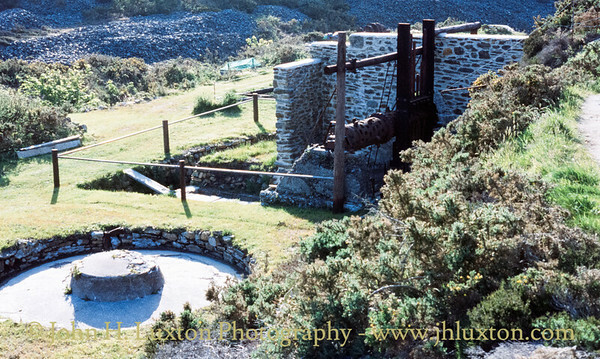 By 1996 restoration of the stamps and buddle were well underway with the vegetation cleared and the area around the stamps tidied up. The restored Blue Hills Stamps. 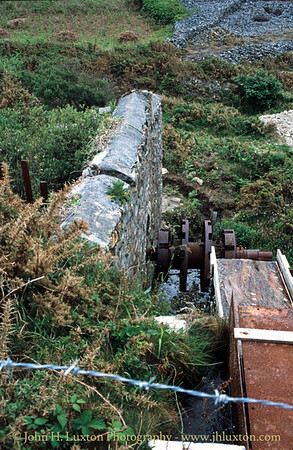 The restored water wheel and launder.